On July 5, the Corporation’s Web page—itself a relative novelty for Harvard’s venerable senior governing board—displayed a startling transformation: after 361 years, with the listing of three new members, the ranks of the Fellows expanded from seven to 10. That shift marked the most tangible evidence of the changes in governance announced late last year (“The Corporation’s 360-Year Tune-Up,” January-February, page 43), and of progress toward an ultimate enlargement to 13 Fellows, including the president and treasurer. One rationale for that growth was to bring to the board diverse kinds of expertise, so the first appointees, named just before Commencement (“Fellows Three,” July-August, page 55), have been scrutinized accordingly: Lawrence S. Bacow, M.P.P.-J.D. 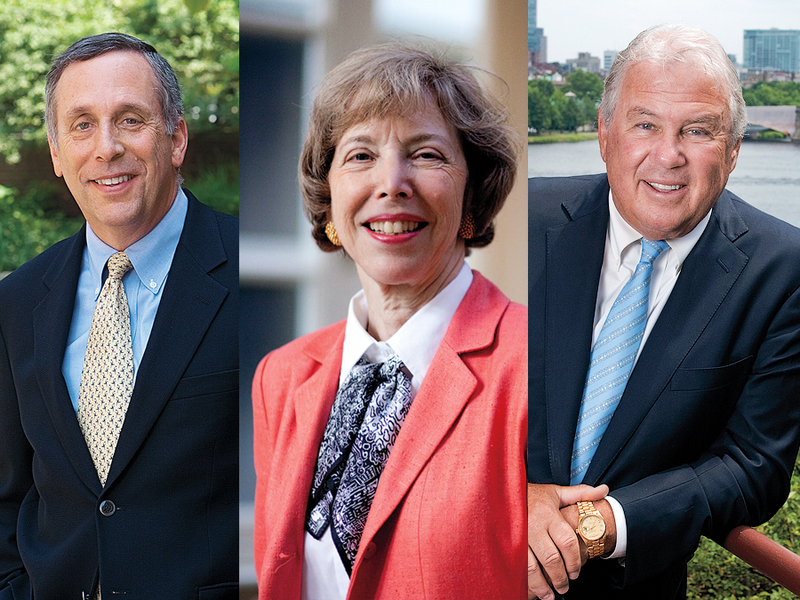 ’76, Ph.D. ’78, past president of Tufts and former chancellor of MIT; Susan L. Graham ’64, Chen Distinguished Professor emerita of electrical engineering and computer science at Berkeley; and Joseph J. O’Donnell ’67, M.B.A. ’71, a Boston business executive. Bacow and O’Donnell live locally, as does William F. Lee, who joined the board last year (“The Corporation’s Crimson Newcomer,” July-August 2010, page 58)—making for ready engagement with the campus and the Boston and Massachusetts communities. Graham and O’Donnell have extensive experience with both the Board of Overseers, the junior governing board, and the Harvard Alumni Association (HAA), at a time when the Corporation seeks to become more involved in alumni affairs and development. Graham, as a faculty member and engineering scientist, and Bacow, as a high-ranking educational leader, complement and strengthen those perspectives on the Corporation. The trio, who assumed their new roles on July 1, made time for separate summer conversations about how their experiences might bear on their new service, and their outlook on Harvard. In that context, he outlined the concerns facing research-university leaders today. All, he said, are “worried about how federal support for research will fare, given the kinds of pressures the federal budget is under. We are all concerned about access to higher education,” because of limits on institutional aid funds as well as public-financing programs. In the wider view, “We are all looking at a world in which there is far greater competition in the higher-education marketplace,” as developing nations invest to create institutions equal in quality to American ones. There is a continuous need to determine how to use technology in teaching and research “in ways that both enhance the educational experience of our students and, ideally, reduce costs and don’t add to them” (a subject he is exploring with William G. Bowen, president emeritus of the Mellon Foundation and of Princeton, and others). Finally, Bacow said, university leaders are striving to assure that their institutions reflect the heterogeneity of the modern world, both in their domestic populations and globally. Articulating those priorities may, in itself, be a useful part of what he brings to interactions with the other Fellows and President Drew Faust. Bacow welcomed the expansion of the Corporation and its efforts to work more closely with the Overseers. Without knowing yet what committees (in formation) he might want to join—“All of what the Corporation does interests me”—he did signal certain immediately relevant tasks. “I suspect I will be involved in issues of facilities and capital planning,” he said, noting his academic interest and experience in the field, including major projects for Tufts’ Boston-based medical and dental centers. And having planned and completed a $1.2-billion capital campaign for Tufts, he emphasized the importance for any university of having people “thinking seriously about how to move, how to advance the institution”—through fundraising, of course, but more broadly through “engagements with multiple constituencies.…This is a job for the Corporation,” he continued, “and I’m pleased to see the Corporation taking it on” at the launch of Harvard’s planned campaign. Susan Graham, reached by phone in California (where she pursued advanced studies at Stanford prior to her academic career at Berkeley), readily admitted she had had little involvement with her alma mater after graduating from Radcliffe—until her twenty-fifth reunion. That rekindled her engagement and led to her surprise election as a director of the HAA, and subsequently to her election as an Overseer. Third, as president of the Overseers, Graham became fully involved in the search that led to Faust’s selection as the University’s twenty-eighth leader. On that occasion, she said that Faust, as a historian, looks to the past, but “as a leader, she looks to the future.” At Radcliffe, she said, Faust had brought people together intellectually to pursue interdisciplinary work; she had been especially impressed by Faust’s role in building up science there. Graham thus joined the Corporation already acquainted with most of her colleagues, familiar with the Overseers’ operation and the evolving closer collaboration between the two boards, and committed to the interdisciplinary collaborations she believes can and ought to take root at Harvard. Although she professed to having to “catch up” this summer, around a trip to Vietnam, she does so from a broad base of knowledge. Joseph O’Donnell’s offices at the eastern edge of Cambridge afford a sweeping view across the Charles River, from the Museum of Science to Massachusetts General Hospital and the financial offices in Back Bay. The panorama neatly represents his career in business, as a significant supporter of biomedical science and research, and as a leading figure in Boston—who remains deeply grounded in his roots across the Mystic River and the Charles. “I worry about the future of the place,” O’Donnell said. “It would be pretty easy for it to become like any other place.” To help forestall that, he has—as an Overseer, HAA director, fundraising volunteer and donor, and business school adviser—paid particular attention to alumni affairs and development, a realm in which the Corporation will now establish a joint committee with the Overseers. During Neil L. Rudenstine’s presidency, O’Donnell reported, he helped Harvard build bridges to local and state government leaders “across the board.” Under President Lawrence H. Summers, he was engaged in Allston planning. That effort—derailed by the financial crisis in 2008—proceeded perhaps better on the permitting and regulatory front, he said, than in terms of Harvard’s internal decisionmaking. As one of three alumni involved in the Allston Work Team and its new approach (see “Rethinking Allston” ), he described it as “the best committee I ever served on,” as deans jointly aired issues and resolved them together in a school and University context. As a side benefit, of course, he got to know most of the current deans.